One thing I can't quite crack with this Blackberry blog is how to make sure the photos get posted in the right order. I think I'm going to give up expecting precision, and let you make your own connections. Among which (connections) today is one of precipitation. I did enjoy a German road sign this afternoon, captured barrelling east down a very snowy mountain between Bregenz (Austria, right-hand end of Lake Constance) and the Allgaeu in Germany. Actually, though, the theme today was snow, over 34 largely vertical miles (so far, 10 still to go), keeping average speed down to 7.3mph (hills really do slow you up) though a healthy max downhill speed of very nearly 40mph. Would have been more if my nerve had held. It didn't and it wasn't. 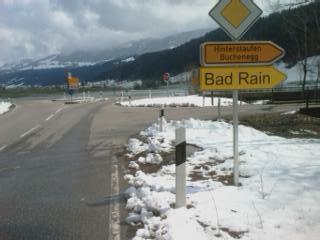 So, it never rains but it snows. For which experience it was good to possess now post-Bern what are proving to be probably the best cycling gloves in the world. Sealskinz, they're called, and I needed a new mortgage to buy them. But they work, awesomely. 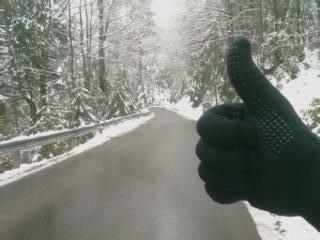 Warm and waterproof, a serious boon on a day like this. Which provided for the most sensational insider views of clouds. Like Joni Mitchell, I have looked at life and clouds (quote from one of her big late 60s hits) from both sides now, back west towards Austria/Switzerland, and north-east to Germany. However, as Raven illustrates above, against the backdrop of what was visible of Lake Constance from the pass, the view mostly really was only of water vapour. 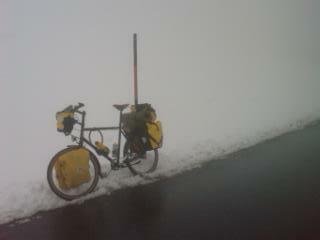 Good for musing, as I pedalled along and up, head-down in first gear, about life and Why One Blogs. Thoughts for a later post, which might be hard to illustrate, as it's mind-and-emotions stuff. 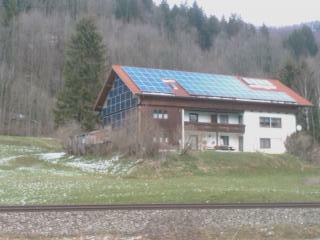 Oh yes, I promised a picture of solar panels in Got-The-Plot-On-Alternative-Energy Bavaria. Sure enough, just this side of the border, a traditional Alpine farmhouse with not only the roof covered in photovoltaic panels, but also the entire end wall. Bavaria pays people five times (I think) their standard rate as electricity consumers to feed power back into the grid. The technical term is feed-in tariffs, and doesn't it just illustrate how dramatically governments can change consumer behaviour with the right economic incentives. Interestingly, Germany is way ahead in this even of Switzerland, where there was scarcely a solar panel anywhere, and not a single windmill. Not to speak of dear old France. On which a final thought for today before I head for my ex's delightful sister-in-law in Wertach, not seen for nearly a decade. I really wasn't making up the difference between France and Germany on the service front. Here, the shops and the cafes are open pretty much all day, and you can get an evening meal until well after nine o'clock. Germany rocks 2 – but Austria ain't bad either, and it's there next.